If not for a failed 2-point conversion attempt with 1:30 remaining in the first half, the score would have been tied at 14. Instead, Nebraska led 14-12, on a pair of Mike Rozier touchdowns. Colorado had out-yarded the Cornhuskers (197-190), with a significant time-of-possession advantage. The Memorial Stadium crowd of 76,268 was perplexed on that damp, overcast afternoon in late October of 1983. Colorado was 2-4 and on a three-game losing streak in Coach Bill McCartney’s second season, while Nebraska was 7-0 and ranked No. 1, as it had been all season. Plus, the game was Homecoming for Nebraska. Not to worry, though, the Husker offense was aptly named “the Scoring Explosion.” And McCartney and team saw the basis for that nickname first-hand. With 2:47 remaining in the third quarter, Nebraska led 62-12. Rozier returned the second-half kickoff 29 yards to his own 33-yard line, gained 13 yards on first down and then wingback Irving Fryar ran 54 yards on a reverse for a touchdown; Scott Livingston added the extra-point kick, and 35 seconds into the half, the Huskers led 21-12. Colorado managed 7 yards on three downs: fourth-and-3 from its own 23. McCartney gambled and called for a fake punt. The snap was bobbled, and the Buffs managed 1 yard. From the Colorado 24, Rozier gained 9, 2 and 13 for his third touchdown. Livingston added the extra-point kick and with 13:07 remaining in the third quarter, Nebraska led 28-12. Dan Wingard kicked off for the Huskers. Colorado fumbled the kickoff, and Nebraska’s Scott Strasburger recovered at the Colorado 28-yard line. A facemask penalty, a 7-yard run by fullback Tom Rathman and a 17-yard touchdown run by quarterback Turner Gill, with a Livingston kick, made the score 35-12. Not even 2½ minutes had elapsed on the game clock. Colorado managed a first down on its next possession before an interception, and 8-yard return, by defensive tackle Rob Stuckey gave the Huskers the ball at the Colorado 34-yard line. On first down, Gill and Fryar teamed up on for a touchdown. With Livingston’s kick, the score was 42-12. Colorado picked up a first down and then went for another on fourth-and-1 from its own 43-yard line. The pass was dropped, however, and Nebraska took over. Rozier took a shovel pass from Gill and gained 26 yards, then was held to 1 yard, then ran 18 yards for a touchdown. This time Livingston’s kick failed, and with 5:58 remaining in the quarter, the score was 48-12. The Buffaloes fumbled the kickoff and defensive back Gary Schneider recovered at the Colorado 14-yard line. Nate Mason replaced Gill at quarterback. Rathman gained 2 yards and Jeff Smith, Rozier’s back-up, ran 12 yards for a touchdown. Dave Schneider, who had begun the season as the No. 1 placekicker, added the extra point, and Nebraska led 55-12 with 5:15 left in the quarter. Colorado couldn’t pick up a first down and punted out-of-bounds at its own 48. This time the Huskers needed five plays and 1:19 to score. Mason and Smith each carried twice, Mason for 22 yards, Smith for 25, then Mason passed 1 yard to back-up wingback Shane Swanson for the touchdown. Schneider added the extra-point, and with 2:47 remaining in the quarter Nebraska led 62-12. Colorado managed a touchdown by the quarter’s end, and the Huskers’ I-back Tim Brungardt scored a touchdown from 1 yard with 8:42 remaining in the game. Mark Hagerman’s kick made the final score 69-19. Nebraska’s first six touchdowns in the third quarter had required 13 plays and only 2:56 in time of possession. The 48 points in a quarter were a Big Eight record and one short of the NCAA record. The 55 points in a half also were a conference record, and the 69 points were a Memorial Stadium record; the previous record was 68 against New Mexico State in 1982 (68-0). 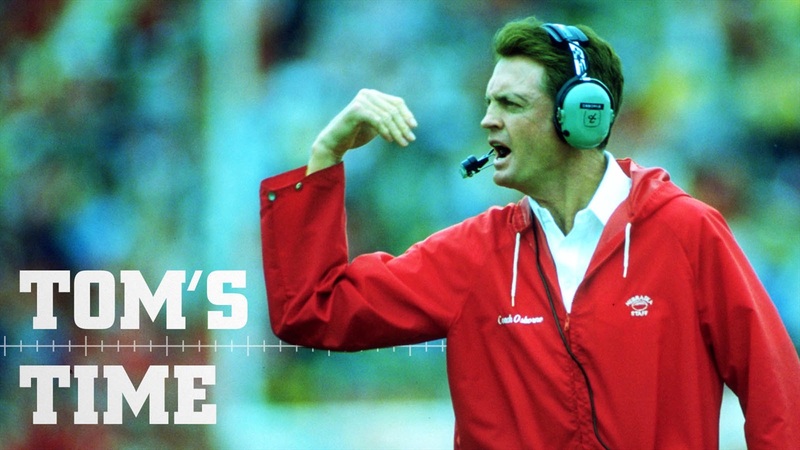 Tom Osborne said he was “amazed” at the way the Huskers broke open the game in the third quarter. “I suppose we’ll have to deal with the ‘running up the score’ charge again,” he was quoted afterward, noting that McCartney was among his best friends in coaching. That charge probably could’ve been made in two of the next three weeks as well. On the Monday before the Colorado game, the Kansas City Times published the results of a survey of 30 Heisman Trophy voters across the country indicating that Rozier was a heavy favorite to win the award. Brigham Young quarterback Steve Young was second in the survey, followed by Gill, who received two first-place votes. Others on the list included Fryar and quarterbacks Jeff Hostetler of West Virginia and Doug Flutie of Boston College. Rozier had rushed for 1,219 yards and 17 touchdowns through the Colorado game. He was averaging 7.47 yards per carry.